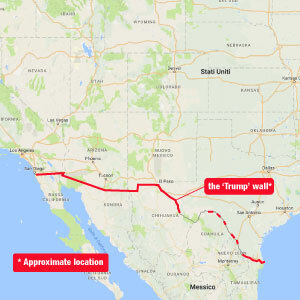 A major feature of the presidential campaign of Donald Trump was his pledge to build a wall on the southern border of the United States that would stop once and forever the “illegal” migration of Mexicans and others from Central America. He told his supporters that Mexico would pay for the wall. But he has now backed off that statement. The U.S., not Mexico, will pay for the wall. And the wall will not be cheap. The U.S. Department of Homeland Security noted that the wall will cost as much as $21.6 billion and will take as long as three years to build (Ainsley, 2017). In this short essay we argue that Trump’s wall will not work. It will not reduce the number of undocumented immigrants in the United States. It will have the opposite effect; it will increase their number. We first examine demographic data on immigration to the U.S., both legal and undocumented. As of 2015 there were around 44 million persons living in the U.S. who were born in another country. Three-quarters, or around 33 million, are lawful immigrants, also known as “legal” or “authorized” immigrants. They include naturalized citizens, persons granted lawful permanent or temporary residence status (e.g., as workers or students), and persons granted asylum or admitted as refugees. The remaining 25 percent of the U.S. foreign-born population, or just over 11 million people, are unauthorized immigrants, also known as “illegal” or “undocumented” immigrants. These are the 11.1 million “illegals” that President Trump is always referring to, whom he wants to deport back across the southern border. Apparently unknown to President Trump is the fact that around two-fifths of these 11.1 million undocumented immigrants, or almost 4.5 million, are what are known as visa overstayers. They entered the U.S. with legal passports and legal visas but either stayed past their visa expiration dates or otherwise violated the terms of their admission into the U.S. Most flew in legally from Asia, Europe and other continents and entered at major airports in San Francisco, New York, Los Angeles, Houston, and elsewhere. Trump’s Wall is not high enough to keep them out. In the U.S. presently, there is no plan to address the issue of undocumented immigration via visa overstayers. The U.S. Department of Homeland Security does not match entry and exit records of persons coming into and leaving the U.S. The Congress mandated an electronic entry-exit system more than 20 years ago, but it has not been implemented because of objections from the tourism industry and other groups. A biometric entry/exit system would likely be able to keep tabs on most of the people entering and exiting the U.S. and would probably reduce the number of visa overstayers. But the implementation of such a system is not in the plans of President Trump. He only wants to build a wall. Hence the numbers of visa overstayers will likely remain at around 4 to 5 million despite Trump’s wall. What about the other 6 to 7 million undocumented immigrants in the U.S.? Who are they? How did they enter the United States? Where are they from? These are the so-called “illegal” immigrants everyone refers to. They are formally referred to by immigration officials as EWIs, or persons who “entered without inspection”. They entered the U.S. without detection or used fraudulent documents when crossing the border. Almost all of them entered at the U.S.-Mexico border, and until recently most of them were from Mexico. Why won’t Trump’s wall keep out the EWIs, irrespective of their country of origin? Why will Trump’s wall result in an increase in the number of EWIs and not a decrease? The stereotype of the undocumented immigrant crossing the Mexican-U.S. border no longer matches the contemporary realities of immigration. Over the decades most of the EWIs who entered the U.S. over the southern border were what are known as circular migrants. The came to the U.S. mostly for low-level jobs in agriculture and construction and related areas, stayed for several months, maybe a year, earned their money and returned home. Many were seasonal agricultural workers from Mexico who, for instance, followed harvests from California’s Central Valley to Washington’s Yakima Valley (Morrison and Poston, 2017). Douglas Massey and his colleagues (2016) have documented these immigration patterns. They have shown that increased border enforcement has seriously disrupted the circular flow of workers who used to come and go, mainly just to California and Texas. Increased border surveillance “has raised the costs of undocumented border crossing, requiring the undocumented immigrants to stay longer in the U.S. so to make the trip profitable.” With greater border enforcement and surveillance, the costs of crossing the border have increased. As a result, the migrants have minimized the border crossing, “not by remaining in Mexico but by staying in the United States.” Simply put, the migrants are no longer circular migrants; they are now being transformed into a permanently settled population of unauthorized immigrants (Massey et al., 2016; Hotchkiss, 2016). Two charts demonstrate this relationship. 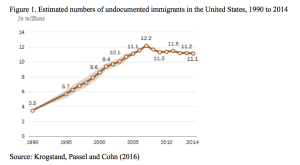 Figure 1 presents annual estimates produced by demographers at the Pew Research Center in Washington, DC of the number of undocumented immigrants in the U.S. from 1990 to 2014 (Krogstand et al., 2016). Undocumented immigrants in the U.S. rose from 3.5 million in 1990 to 11.1 million in 2014. The 24-year period between 1990 and 2014 saw a phenomenal increase, of more than 210 percent. 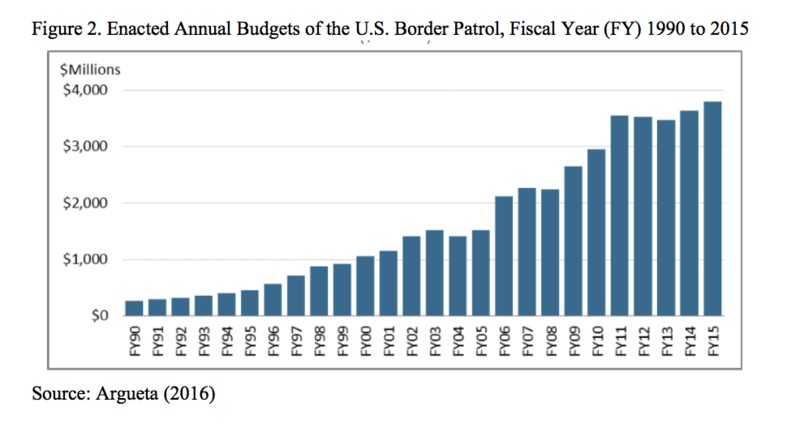 The second chart presents data on U.S. Border Patrol appropriations (Argueta, 2016). 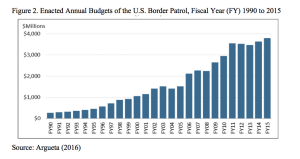 It shows clearly that border enforcement and surveillance appropriations have grown steadily over the period of 1990 to 2015 from $263 million in 1990 to $1.4 billion in 2002 to $3.8 billion in 2015. Relating the data in the first chart with the data in the second shows that the rapid escalation of border surveillance and enforcement initiated in an attempt to halt the flow of undocumented immigration over the Mexico-U.S. border has not worked. Militarizing the border has been associated with an increase, rather than a decrease, in the number of unauthorized immigrants. Militarization has transformed undocumented migration into the U.S. from a circular flow of migrants into, and out of, a few states, to a permanent settlement of migrants in virtually all the states of the continental U.S.
Trump’s wall may well make this relationship even stronger. Immigration to the U.S. is highly selective of the staunchest and the most motivated. Only the strongest and most advantaged will attempt the crossing. Demographers are well-aware of the selectivity of migration (Poston and Bouvier, 2017). With Trump’s wall the journey to the U.S. will become more dangerous and many migrations will fail. But eventually most attempts will be successful. Trump’s wall will not keep out of the U.S. this strong-willed, motivated, and talented population. The specter of a Trump’s wall will cause the would-be circular migrants to settle and to stay in the U.S., and not return to their homes in Mexico and other countries in Central America (Morrison and Poston, 2017). We foresee that within ten years of such a wall being erected, there will be at least as many EWIs as there are now (6 to 7 million), and perhaps several million more. This means that along with the 5 million visa overstayers, there will be at a minimum a total of over 11 million undocumented immigrants in the U.S., and possibly many more, most of whom transformed into a permanently settled population of residents. Thus, a $20 billion investment intended to wall people out of the U.S. will have kept people in the U.S. Trump’s wall won’t work. Ainsley, J.E., 2017. “Trump Border Wall to Cost $21.6 Billion, Take 3.5 Years to Build: Internal Report.” Reuters World News, February 9, 2017. Argueta, C.V., 2016. “Border Security: Immigration Enforcement Between Ports of Entry.” Congressional Research Service, April 19. Hotchkiss, M. 2016. “Tighter Enforcement along the U.S.-Mexico Border Backfired.” Phys.Org News, April 21, 2016. Krogstand, J.M., J.S. Passel and D. Cohn, 2016. “5 Facts About Illegal Immigration in the U.S.” Pew Research Center, November 3, 2016. Massey, D.S., J. Durand, and K.A. Pren, 2016. “Why Border Enforcement Backfired.” American Journal of Sociology 121: 1557-1600. Morrison, P.A. and D.L. Poston, Jr., 2017. “Three Myths of U.S. Immigration: The Reality? A Border Wall Would Keep Undocumented in the U.S. — Not Out of It,” San Antonio Express-News (March 5): F1. Poston, D.L., Jr., and L.F. Bouvier, 2017. Population and Society: An Introduction to Demography. 2nd edition. New York: Cambridge University Press.